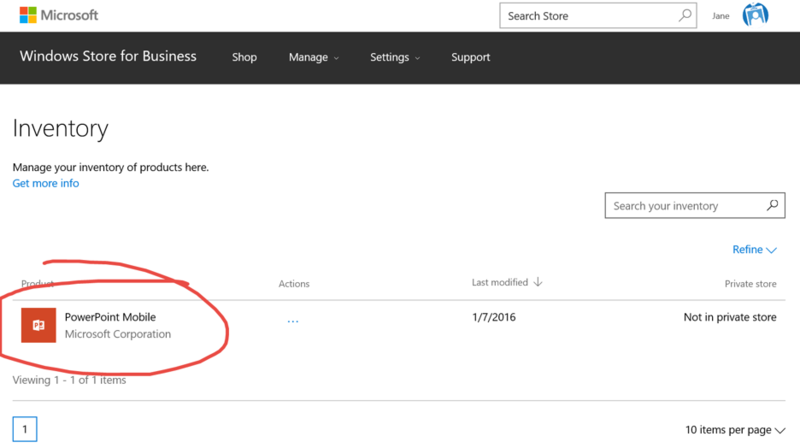 Following on from my previous post, I need to get the 2 users that I’ve created some apps to work with and so I can go back to the Windows Store for Business as my admin user, Jane, and see what can be done there. And I think I that led me to understand that an organisation might want to provision (e.g.) 100 copies of some app for all/some of its members without necessarily putting that app into a private store. The users could just find the app in the public store with the benefit being that the licensing is already sorted out for them. Naturally, an organisation might want to put it into their private store to add some more prominence and that would be doubly relevant for an organisation that chooses to hide the public store from its members. 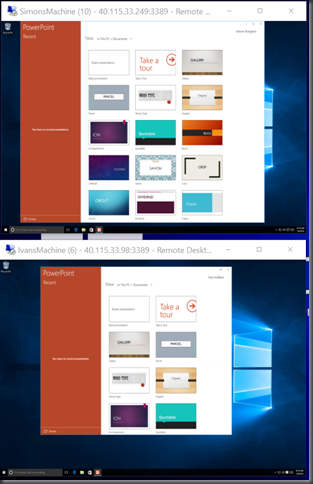 The other aspect of the private store seems to be that the apps in that store are visible to all members of the organisation, not some particular subset of that membership. 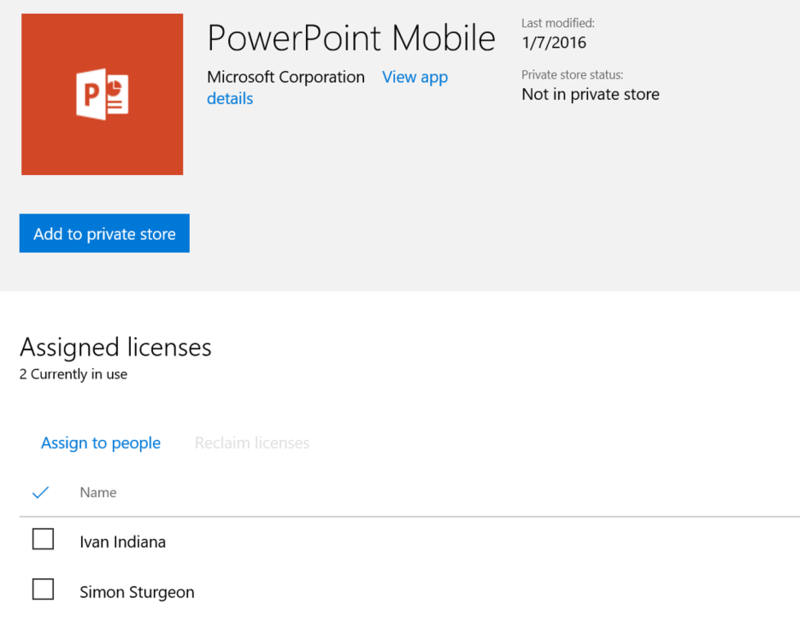 We have the user, Simon, who has never used the Windows Store in his ‘life’ but he already ‘owns’ PowerPoint Mobile which really means that his organisation has already provisioned it for him. 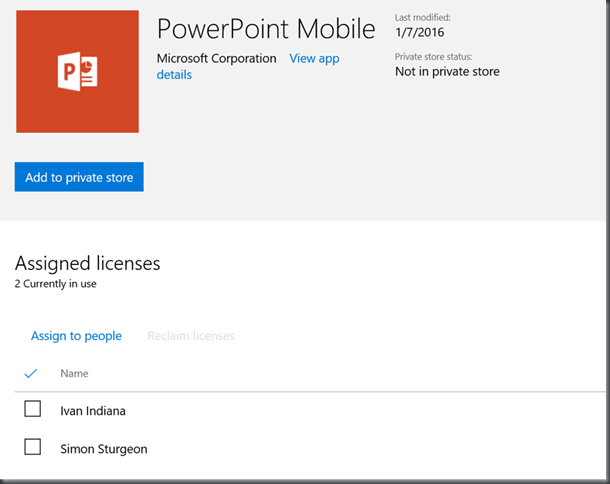 Naturally, it’d be more exciting if there was a price associated with PowerPoint Mobile but I still found this quite exciting – there’s no need for Simon to have a Microsoft Account, there’s no need for him to get out his credit card, etc. – the organisation has done it for him. 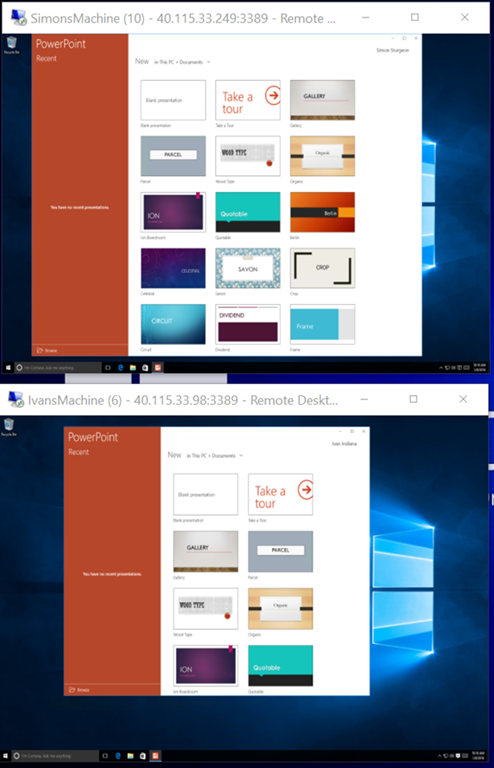 I then immediately wondered what would happen if the admin, Jane, turned nasty and revoked access to PowerPoint Mobile for Ivan and so I went back to the portal and tried that. 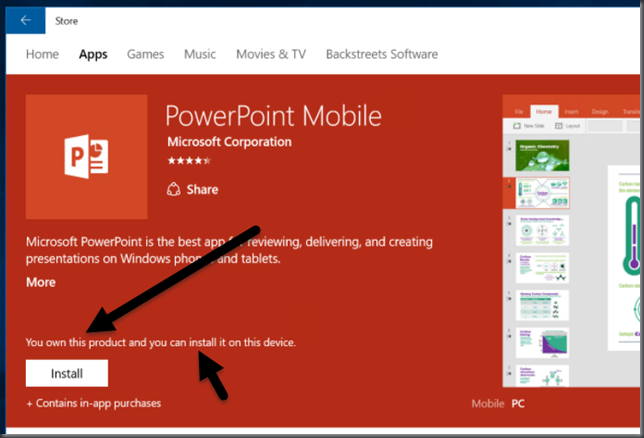 Ok, so if I now go over to Ivan’s machine and attempt to run PowerPoint Mobile, what do I get? Well, it certainly didn’t stop Ivan running the app immediately but that would perhaps be a bit unrealistic. 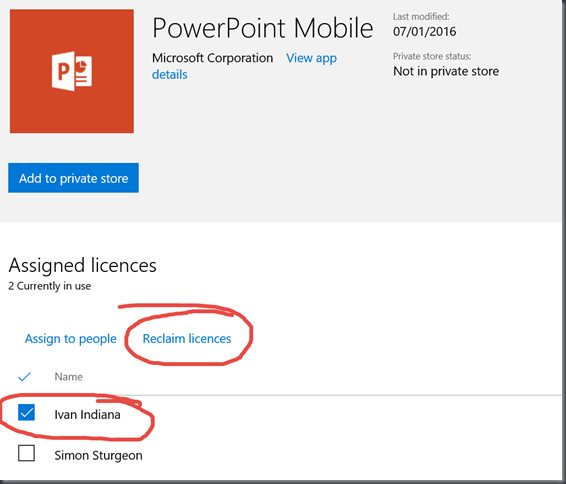 Update: I updated this post here after checking how this process for reclaiming a license here works and it’s definitely not intended to be an instant process. 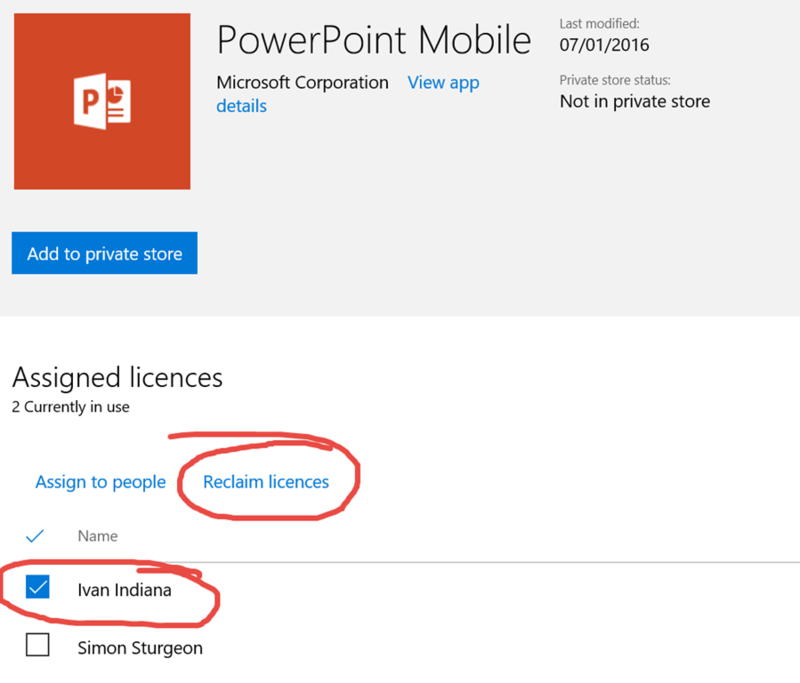 There are more moving parts involved than that but, at some future point, the license that was reclaimed from Ivan here will come through and he’ll no longer be able to run the app. 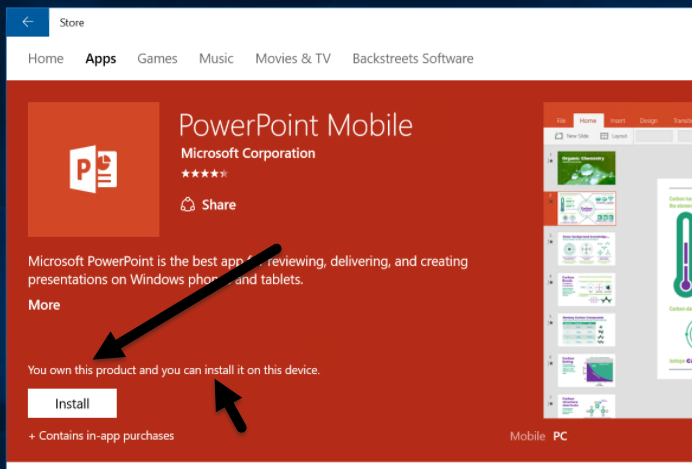 An app developer has to opt-in to allow this offline mode which allows for the app to be built into a disk image and doesn’t require access to the Store at the point where the app is run and so doesn’t (AFAICT) enforce licensing numbers. I’m not planning to try out offline licensing as part of these posts – it’s there and it’s something I can definitely see a place for but, at the time of writing, it feels like the online mode is more interesting to explore.